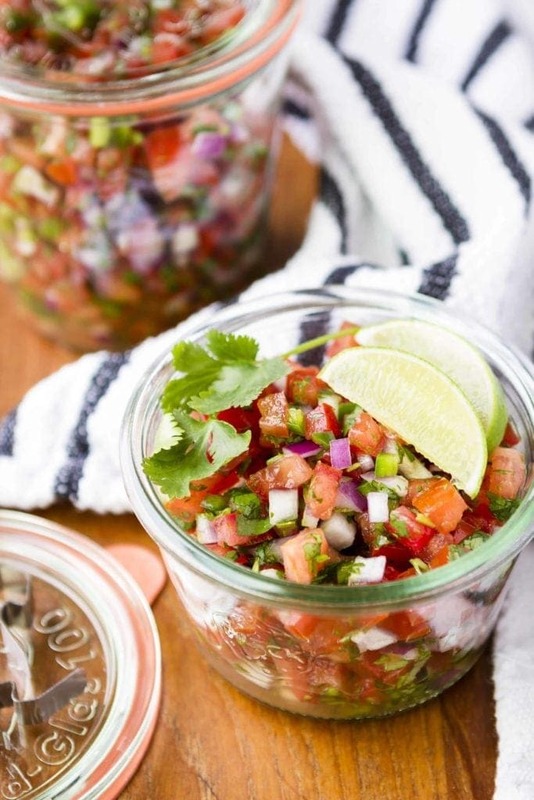 These Healthy Salsa Recipes are great for a healthier snack or topping to your meals! All of these salsas are paleo, whole30 and naturally gluten free. Perfect for snacking on or adding to salads, tacos, chicken or fish! Who doesn’t love chips and salsa?! With the weather (finally!) getting warmer, I’ve been making/eating a lot of salsa. It’s the perfect lighter snack to have in the afternoons, or on the weekends with friends over drinks (like these Lighter Watermelon Mojitos , yes please!). The list goes on and on! If you’re on a Whole30 – it’s a great way to add flavor to dishes.. and if you’re not on a Whole30 it’s perfect for snacking on with a big bag of chips! 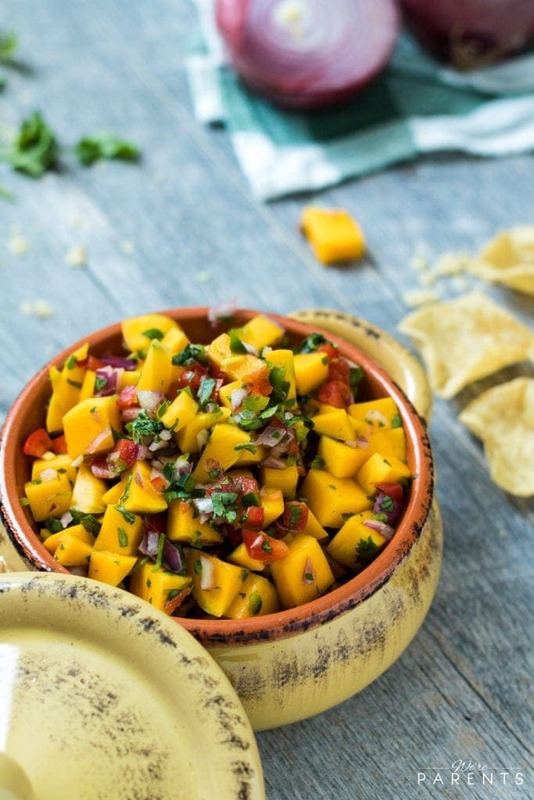 Our Pineapple Mango Salsa is one of my favorite recipes to make as a snack or a topping to lettuce wraps/ tacos. This salsa is my go to, but lately I’ve been looking to switch it up. I reached out to some of my favorite foodie bloggers + asked if they had any healthy salsa recipes to share – and they delivered! 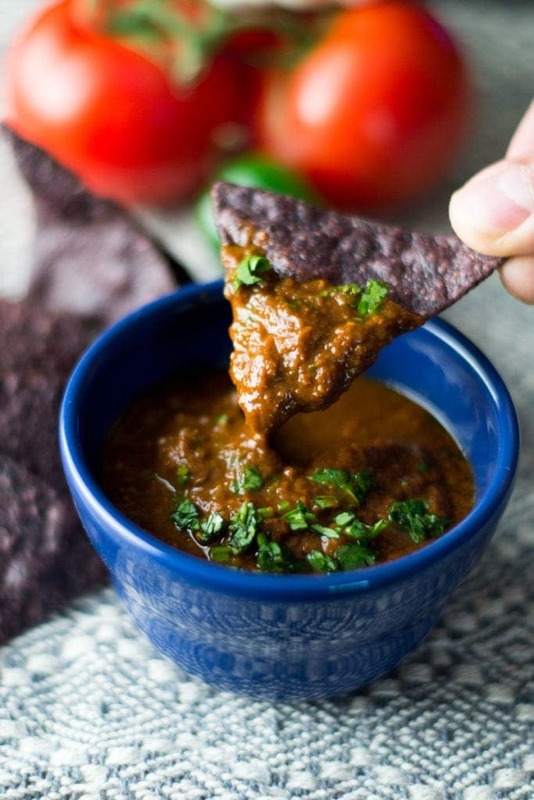 All of these salsa recipes are healthy, whole30, paleo, and gluten free! If you’re feeling lazy and don’t want to make your own salsa, here are some healthy jarred salsas! I love mango salsa! It goes so well with everything! And tastes so refreshing. Cant wait to check out these other salsas. I am obsessed with tortilla chips and salsa lately! Me too!! It’s such a yummy snack! 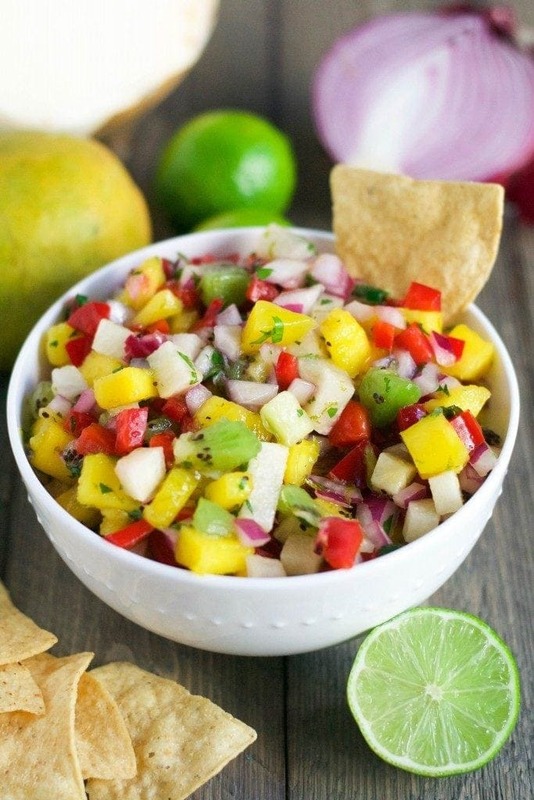 I love mango salsa and all salsa really! Same here! They’re all delicious! i plan to eat all the salsa tomorrow! the hotter the better! I love experimenting with salsas now that I like the ingredients! It’s always fun to try new ingredients! Thanks for letting us include it!! Totally agree- gotta have the chips + salsa! Now you have me wanting to whip up one of these fresh salsas! Definitely pinning this post! I never met a salsa I didn’t like. Wonderful idea for a roundup. Right there with ya, Jill! I love all salsas! 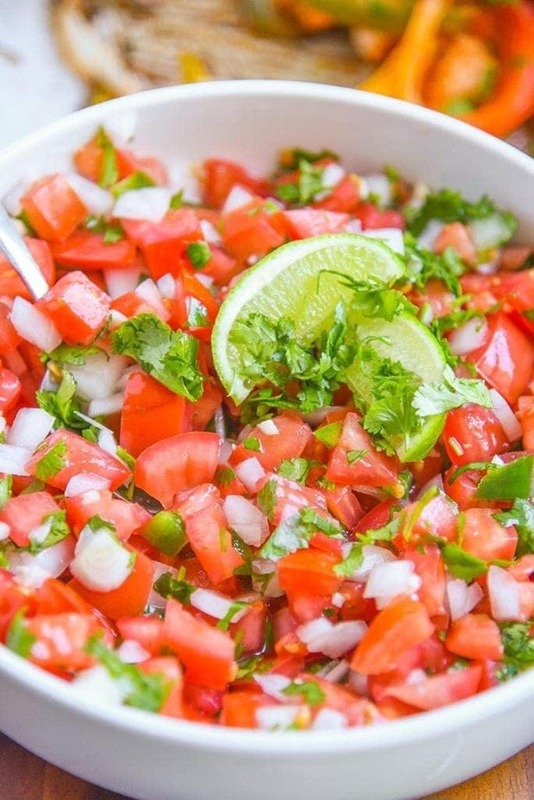 I just posted a Strawberry Salsa that is dreamy! I saw it!! Looks SO good!! You have my EVERY salsa need covered — thanks! These all look so good! Now I want to have a salsa party! This looks so fresh and light. Have to try it! Yum! 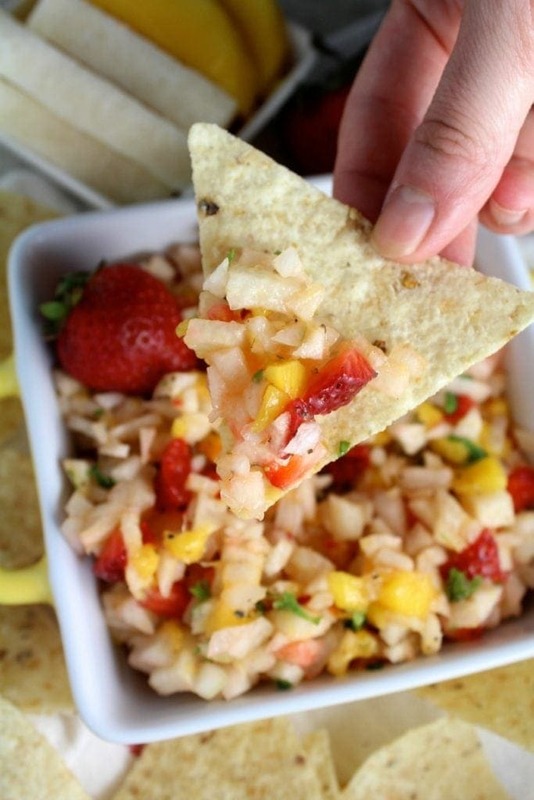 I’ve always been a fan of pineapple salsa – sweet and not too spicy! Thanks for letting us include it, Susannah! I am obsessed with salsa! I put it pretty much on top of so many things–omelets, tacos, salads, stir-fries and even just as a dip! Me too!! It’s SO good!